In this post we introduce “aromaticity”, a term for describing a collection of three [note] main properties that distinguish benzene from (hypothetical) cyclohexatriene. [This collection of features is not unique to benzene. We’ll describe other aromatic molecules in the next post. See “Rules For Aromaticity“]. In the sections below we go through each of these three features in detail. What’s “resonance energy” again? Let’s start with cyclohexene and build our way up. In case you can’t picture it, cyclohexene is a six membered ring containing a single pi ( π)bond. If you treat cyclohexene with hydrogen gas (H2) in the presence of a noble metal catalyst such as Pd supported on carbon (Pd/C), you form cyclohexane. 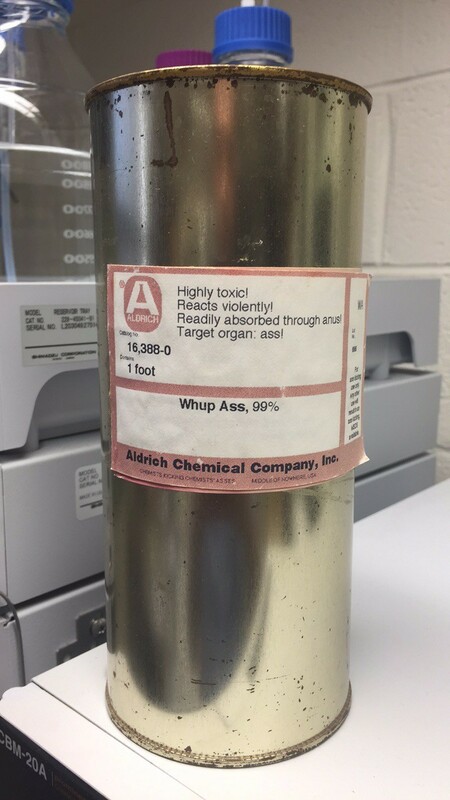 The reaction liberates 28.6 kcal/mol (120 kJ/mol) of heat. If you’re in second semester organic chemistry, there’s no doubt you’ve seen this reaction before. Now for a slightly more interesting question. What happens to the enthalpy of hydrogenation when we add a second double bond adjacent to the first one: 1,3-cyclohexadiene. (There’s another isomer – 1,4 cyclohexadiene – which we won’t concern ourselves with for this example, because the double bonds are not conjugated). The enthalpy of hydrogenation in this case is 55.2 kcal/mol (231 kJ/mol) ; almost, but not quite double of that for cyclohexene (2 x 28.6 = 57.2 kcal/mol). This is still an interesting result, because it tells us that having those two double bonds together results in a little bit of extra stability (2 kcal/mol) versus two isolated pi bonds. We call this extra stabilization (2 kcal/ mol) “resonance energy” . It’s a consequence of conjugation – extending the p orbital overlap. Finally, let’s move on to cyclohexatriene. What happens when there are three pi bonds in the ring? We might naively expect the hydrogenation to liberate about (3 x 28.6 kcal/mol = 85.8 kcal/mol) of heat. As it turns out, when we try to hydrogenate “cyclohexatriene” under normal conditions (Pd/C, room temperature 1 atm of H2), nothing happens. It’s inert. Gradually we increase the heat and pressure. Still nothing happens. Cyclohexatriene refuses to hydrogenate. Something strange is clearly going on here. Clearly, drastic measures are required. In desperation, we march to the stockroom and break out the heavy artillery. At 180-220°C and 25-30 atmospheres of hydrogen gas, “cyclohexatriene” finally succumbs to hydrogenation to give us cyclohexane. The results of the enthalpy measurement are shocking. Recall that we expected the reaction to liberate 85 kcal/mol of heat. In fact, the reaction liberates 49.8 kcal/mol (208 kJ/mol) of heat. Our guess was off by 36 kcal/mol. The heat liberated by hydrogenating cyclohexene and cyclohexadiene grew in roughly linear fashion, but adding that third double bond unlocked an important emergent property. First, it might help to take these energies and visualize them on a graph. Think of it as being a bit like standing on successive rungs of a ladder, with each “rung” representing a new pi bond. The “height above ground” corresponds to the energy released upon hydrogenation of the three successive molecules to the same final product (cyclohexane). 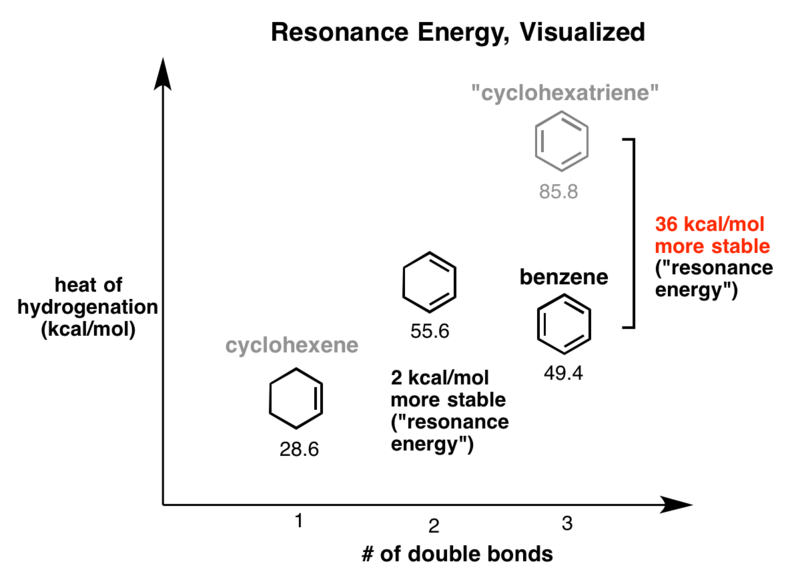 Going from the “second rung” (cyclohexadiene) to the ground state released almost twice as much energy than did going from the “first rung” to the ground state. It was about 3% less (2 kcal/mol) due to resonance energy. We expected the “third rung” of our imaginary ladder to be another 26 kcal/mol or so higher up. In fact, the third rung is about 6 kcal/mol lower than the second rung. Have you ever climbed a set of stairs with your eyes closed and, reaching the top, stumbled after your foot expected to land on a step that’s not there? It’s a lot like that. As you probably know by now, our “cyclohexatriene” actually goes by a different name: benzene. Benzene has been known since at least the Middle Ages. 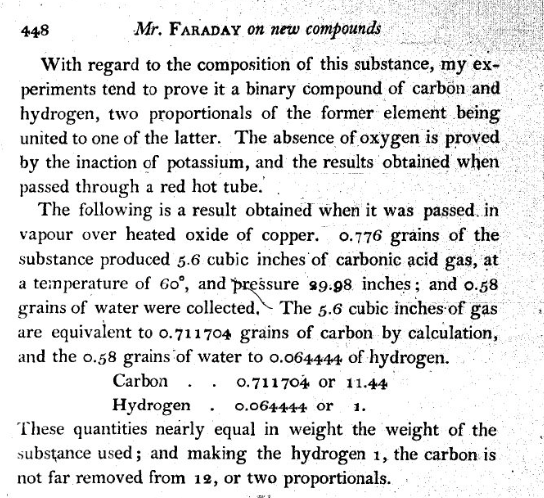 Michael Faraday isolated it and originally determined its composition as C12H6 (later revised to C6H6 when the atomic mass of carbon was corrected) through burning a sample and measuring the samples of CO2 and H2O given off. Here is Faradays sample of benzene, which he named “bicarburet of hydrogen”. Michael Faraday’s sample of benzene. By the 1860s it was known that the molecular formula of benzene was C6H6, all of the hydrogens were equivalent, and that valence bond theory required that there be 4 bonds to carbon. Many structures were proposed for this molecule. It fell to August Kekulé in 1865 to propose the correct, cyclic structure of benzene, which may or may not have been inspired by a dream about a serpent eating its own tail. Something still bothered Kekule about this structure, however: disubstituted benzenes always seemed to be missing an isomer. Take dichlorobenzene for example. From this structure, you’d expect 4 isomers: 1,2, 1,3, 1,4, and 1,6 (the difference between 1,2 and 1,6 is subtle, but they are different nonetheless). The problem is that only 3 isomers of dichlorobenzene had ever been isolated and characterized. 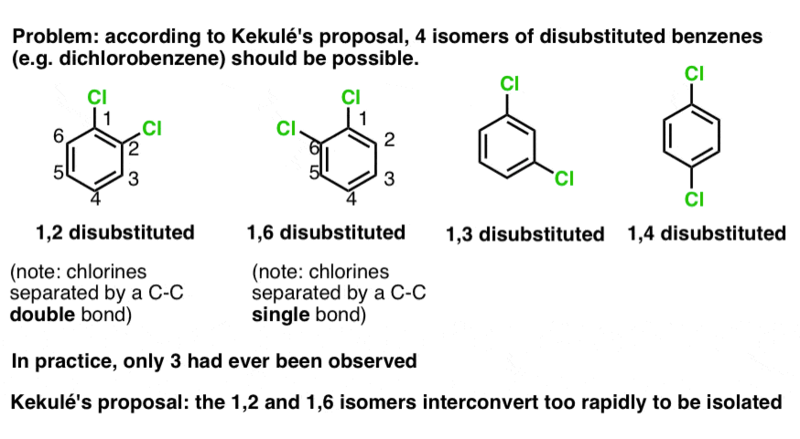 Kekule’s solution to this problem was to propose that 1,2 dichlorobenzene and 1,6 dichlorobenzene interconvert too rapidly to allow for either to be separated. It wasn’t until X-ray crystallography was developed that this picture was shown to be incorrect. In 1928 Kathleen Lonsdale showed that all six C-C bond lengths in hexamethylbenzene were equivalent. She later determined the structure of benzene itself, which established the length of each C-C bond as 1.40 Å (140 picometers). Equal bond lengths is inconsistent with two interconverting molecules. Rather, it suggests that “1,2” and “1,6” dichlorobenzene are actually resonance forms of the same molecule and the “true” structure of benzene is a hybrid of these two structures. One way of describing this is that the pi electrons in benzene are delocalized throughout the perimeter of the molecule, forming a kind of circle, or torus. This is sometimes conveyed by drawing benzene as a hexagon with a circle in the middle. Let’s go back to reactions. 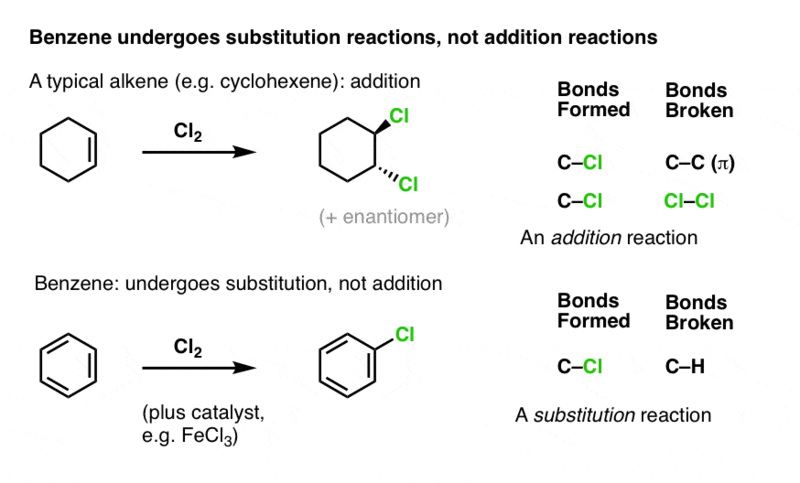 We saw that benzene is a lot less reactive in hydrogenation reactions than what we’d expect from an alkene. In order for hydrogenation to occur, you have to subject it to tremendous heat and pressure. You might reasonably ask: does benzene differ in its reactivity from alkenes in other ways as well? Here’s one of the most prominent differences. As we’ve seen, alkenes typically react with electrophiles to give “addition” products (break C-C pi, form two new adjacent single bonds to carbon). Case in point: chlorination (see below). Benzene is much less reactive toward chlorine than a typical alkene – it generally requires a catalyst in order for chlorination to occur (FeCl3 is a popular choice here). When it does react, instead of giving addition products, we instead see a substitution product (break C-H, form C-Cl). This turns out to be a very common class of reaction with benzene and its derivatives, a reaction we call “Electrophilic Aromatic Substitution”. We’re not going to get into why this happens just yet. For now, lets just satisfy ourselves with the what. More on that in a few posts. 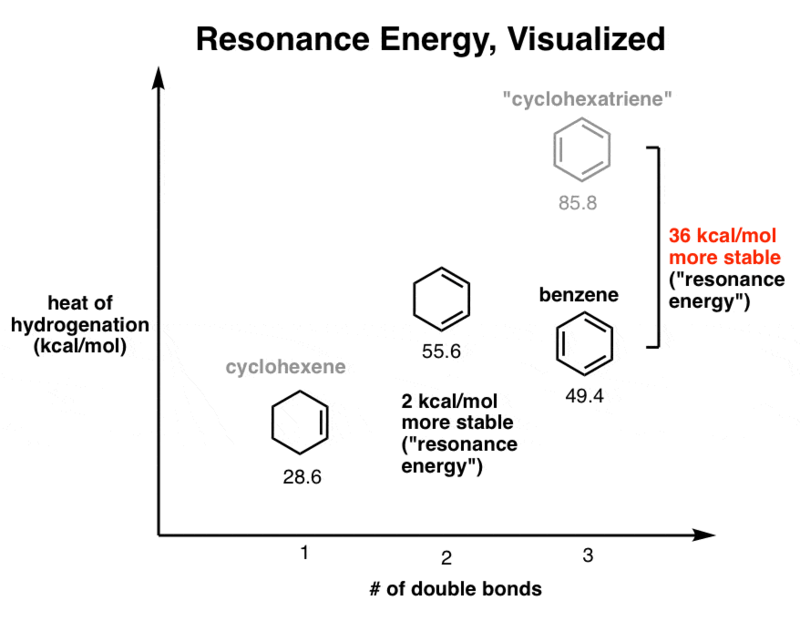 Let’s review the three* [note] important properties we’ve noticed about benzene so far. This collection of special properties has been known since the late 1800’s, and was given a special name that we are now stuck with: aromaticity. It actually has nothing to do with their aroma, although it was noticed that a number of sweet-smelling molecules all had these properties in common. You might reasonably ask: is aromaticity unique to benzene and its derivatives? The answer is no – it turns out that aromaticity is such a fundamental and important property that it deserves its own chapter(s) in introductory textbooks, which is why we will be writing a whole series on this phenomenon. 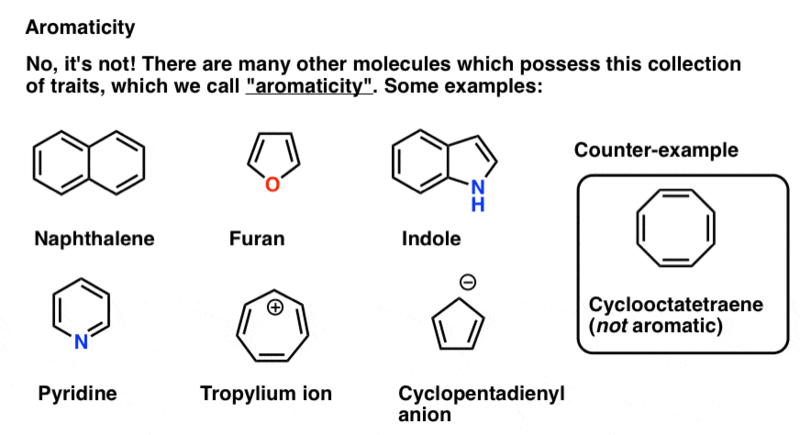 molecules with rings containing atoms other than carbon (furan, indole, pyridine) [aromatic molecules containing an atom other than carbon are often called “heterocycles”]. There’s even molecules entirely lacking in carbon which have some properties of aromaticity (borazine). The bases of DNA (adenine, cytosine, guanine, thymine) have aromatic character. However, molecules are not aromatic simply by virtue of being cyclic and having double bonds at the perimeter. Cyclooctatetraene (above right) is not aromatic, and behaves like a normal conjugated alkene. It’s enough to make you scratch your head. So how can we tell what makes a molecule aromatic? So why is benzene aromatic, but cyclooctatetraene is not? How can we tell if a molecule is aromatic? What are the rules? Thanks to Matt Knowe for assistance with writing this post. [Note 1] 36 kcal/mol is a huge deal in energy terms. A C-C pi bond is worth about 60 kcal/mol, so the energy stabilization of aromaticity is worth about half that number. *[There’s a fourth diagnostic property of aromaticity – ring currents – which is observed in an applied magnetic field, such as when obtaining nuclear magnetic resonance (NMR) spectra. There’s no need to get into this right now, so it will get no further comment]. That’s a forum for graduate students, and others, seeking help with synthesis.